Lucina is a melee all-rounder who focuses on her high Attack to defeat her enemies. Attack is the most important stat she has, followed up by Resistance, Defense and Speed. Extra Resistance helps Lucina survive engagements with dragons and mages, while Defense is better for fighting other swords, bows, and daggers. Speed isn’t quite as important, but it still a valuable stat and should never be used as a bane. This is because she needs it to avoid follow-up attacks from enemy swords. Finally, HP is Lucina’s least valuable stat. Due to her ability to regenerate HP, Lucina cares little about the size of her total HP pool. +ATK: While Lucina can benefit from many boons, Attack gives her a much-needed edge when punching through defensive threats. RES: Resistance is best kept neutral. While Lucina loses against the tirade of blue mages, she wants as much Resistance as possible to survive against dragons. DEF: At a low base 25, she needs all the defense she can get. It also helps Lucina sustain through multiple physical foes. SPD: Base 36 Speed makes Lucina quick, but not as quick as units like Karla who choose to invest in their Speed. Most of her counters can OHKO her or use Swordbreaker, meaning her Speed is not overly important. It is not recommended to reduce this with a bane, since it will swing important matchups with Corrin(F) and Ayra against her. -HP: HP by itself, does little for Lucina, who can heal with her Falchion and Renewal. A bane in HP is nicely offset by Lucina’s weapon refine. This set lets Lucina reach her max potential, as a threat on both phases and as a team support unit. Thanks to her great statline and Falchion stat boosts, she can invest into supportive skills while remaining a powerful frontline fighter. She can work on the enemy or player phase, but tends to prefer the enemy phase for most foes. Some enemies require her to do one or the other: Brave Ike she must defeat on the enemy phase, and Hector on the player phase. Lucina’s Falchion is the backbone of the build, and its special refine gives her a huge boost to her base stats. Thanks to the requirement of being next to an ally, Lucina is great with Spur skills such as Spur Def/Res or Spur Atk/Spd. The former is best for defensive allies, and the latter for offensive ones. Her support skills include Renewal, which stacks with Falchion’s effect to provide 20 HP healed at the end of every second turn. Reciprocal Aid allows Lucina to effectively heal allies up to her own max HP, and with Renewal + Falchion to restore health, Lucina can stay healthy for a long time. If Lucina is being controlled by Autobattle, the AI will make better use of a Dual Rally skill than Reciprocal Aid. In terms of combat, Distant Counter is a must to counter green mages and red ones without the power to OHKO her. Fury is a much cheaper option that gives her a strong boost in close-quarter encounters. Fury can outperform Distant Counter depending on teammates: having strong allies with Distant Counter may mean she does not necessarily need it. Atk/Def Bond is similar, but is better if Lucina wants to avoid the HP loss from Fury. Quick Riposte is very important, granting her the ability to one-round many foes and handle threats such as Corrin(F). Lucina does not rely on her Special to KO, making double attacks very valuable for her. Dragon Fang is the strongest Special for her, but has a slow charge time without skills to lower it. Sol and Aether are other options which provide healing, and are great when Autobattling with her. Alternatively, Lucina can go for Quick Riposte in her B slot, and take the Atk/Def Bond seal, effectively replacing Renewal with Atk/Def Bond. This will cut Lucina’s healing ability significantly, but gives her a substantial power boost. This makes her better at combat, but takes away some of her unique strengths as a support unit. A slightly different version of Lucina, this build is for those who want to transform her into an anti-dragon unit with a bigger emphasis on combat. This version of Lucina is more enemy-phase reliant thanks to Wrath becoming stronger once she’s taken damage. This time Lucina is not worried about team support and picks up Wrath to KO her enemies. This set aims to KO two enemies: First with Quick Riposte and Distant Counter, and the second with a Wrath-boosted Special. Quick Riposte is selected to help Lucina double faster foes and KO them within a single round. Wrath gives her a much-needed power boost and also makes subsequent Special triggers easier. The biggest choice on this build is Distant Counter vs Warding Breath. Distant Counter allows Lucina to smack mages on the counterattack, KO’ing many in just one hit provided they aren’t specced for OHKO’s. Warding Breath boosts her Resistance and allows her to take a stronger Special, ensuring her matchups against dragons are won even with merge disadvantages. Draconic Aura is best with Distant Counter, while Dragon Fang is for Warding Breath variants. Rally Def/Res and Spur Def/Res are mainly picked to synergise with her Falchion and give support to dragon and armored allies. She can also provide healing, but with only 10 HP healed every two turns, Ardent Sacrifice is better suited with it’s lower cap. Lucina is one of the most iconic characters in Fire Emblem. Hailing from Fire Emblem Awakening, she appears in heroes as a red sword-using infantry who wields the legendary Falchion. With it, Lucina deals bonus damage against dragons and can restore her HP with a healing effect. It also has a powerful unique refine, giving Lucina +4 to Attack, Speed, Defense, and Resistance when positioned adjacent to an allied unit. She shares this effect with her father Chrom: Exalted Prince, and her alternate version, Marth: Enigmatic Blade. For a unit available way back at the game’s release, Lucina has an excellent statline. 34/36 Attack and Speed are still amazing, while her base 25 Defense is low, but workable considering her Falchion’s refined effect. Her only real weak point is her Resistance, at a lowly 19 sees her take heavy damage from all sources of magic damage. Lucina’s refine gives her a substantial all-around boost, notably letting her scrap with the fastest swords without Speed investment. She is one of only a handful of units who can perform offensive, defensive and supportive roles. Lucina brings a ton of power to a team, and excels in a number of different game modes: Arena and Tempest Trials being two of the her best When all is said and done, Lucina is one of the best sword-wielding units in the game, and one of few who has remained exceptional despite the passage of time. Base 34 Attack and 36 Speed allow Lucina to threaten units on both phases. Lucina relies on her Attack more than other units, as she does not usually run Wrath to KO units. High Speed is mostly important defensively, protecting her against double attacks from Ayra, Cordelia and Corrin(F). Her Speed in particular is what sets her apart from her father Chrom: Exalted Prince, who shares her weapon and refine effect. Wields the versatile and powerful Falchion. Lucina’s biggest claim to fame is her access to the Falchion. It deals effective damage against dragons, and also heals her for 10 HP every two turns. When refined, it also gives her +4 Attack, Speed, Defense and Resistance when Lucina is standing beside an ally. She has the ability to defeat all common dragon builds in the Arena, although rare Triangle Adept + Swordbreaker builds will give her headaches. The effect from her weapon refine is easy to activate, and also stacks well with Ally Support, Rally Skills and Spur Skills. Brings a ton of utility to the field. What sets Lucina apart from other swords is her ability to be used as a support unit. She can take Renewal and Reciprocal Aid to become a psuedo-healer, allowing her to be useful even when not fighting directly. This healing can support allies in a duel, or allow them to regain skills such as Quick Riposte with HP thresholds. Lucina’s presence enables other units on your team to fight much more effectively, preventing them from being worn-down over multiple fights or due to skills such as Fury. Prone to OHKO’s due to low defenses. Lucina is great at sustaining over multiple battles, but can be OHKO’d easily by strong sources of damage. In particular Blade mages have the requisite damage to end her life with a single hit. She also has to be careful about who she initiates into, as a Wrath-boosted Special from many high-tier swords will spell her demise. This problem is exacerbated when Lucina isn’t receiving her refine effect, lowering her defenses and Speed to dangerous levels. Weak to Swordbreaker, a common budget skill. Compared to other top-tier swords, Lucina is much more prone to Swordbreaker. Other swords don’t care about being doubled, as their foes usually go down to a Wrath-boosted Special before it can happen. Zelgius and the Black Knight can OHKO their foes, and Elincia’s Amiti allows her to initiate with a double-attack. Many low-tier units choose Swordbreaker to force wins against units just like Lucina, meaning she must check enemy skills before engaging opponents. Lucina brings many things to a team, and so many units clamor to be her team-mate. She does not require any external support to KO dragons, but her weakness to Swordbreaker and strong magic damage means she can certainly benefit from some support. Most of the skills that synergise well with Lucina can be inherited by all units. Therefore, the units who can support her are mainly defined by their skills, not their weapon type. Allies with Spur Skills: Spur skills are very easy to use in conjunction with Lucina’s Falchion. Spur skills can be inherited to anyone, and are already very common on Arena teams. Having Lucina’s Ally Support partner use Spur Skills will give her a massive boost. Mage Tanks: Even with Distant Counter, Lucina will fare poorly against mages. Mage tanks like Felicia, Faye and Fjorm can handle units that Lucina struggles with. Julia and Deirdre deserve special mention, as they can also beat Triangle Adept + Swordbreaker Ninian, Nowi and Corrin(F). 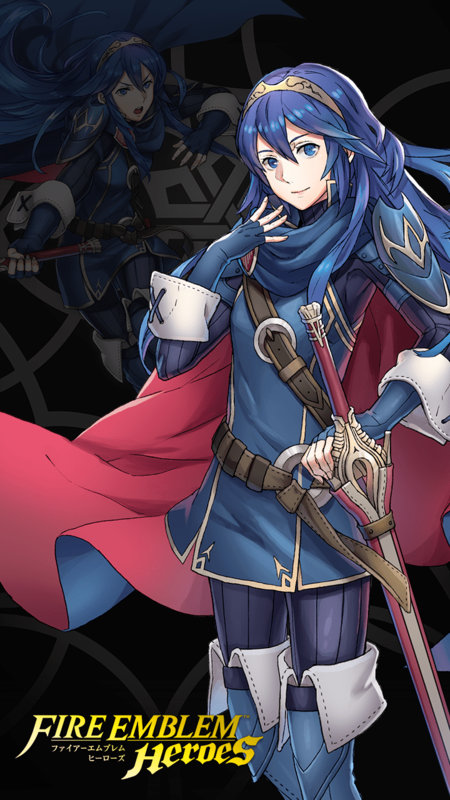 Blue Dragons: Some of the best partners for Lucina are blue dragons themselves. They are very good at handling Swordbreaker units, and with Lucina to handle enemy Falchions, can form a powerful duo. They even do well against mages with their refined breath weapons. Corrin(F), Nowi, Ninian and Kana(M) are all solid partners for Lucina. Armor: Lucina is fantastic at both playing with and supporting Armored allies. She can keep them within the HP range of skills such as Quick Riposte and Vengeful Fighter, and they in turn can help Lucina by eliminating mages and giving her Spur skill support. Fallen Hardin, Hector, Halloween Jakob, Effie and Amelia are the best partners, but any armor can be used well with Lucina. Lucina’s counters are split into two camps: Those who can flat-out OHKO her, and those who can double attack to KO her. As such, she fears strong blue blade tome users. Lucina is also susceptible to Bold Fighter and Swordbreaker, two skills that guarantee double attacks against her. With enough defensive buffs however, she can escape KO’s from some units that fall into these categories. Mages: Lucina fears mages, especially those who are blue or who wield Blade tomes. Linde, Delthea, Lute, Reinhardt, (LA)Lyn, Micaiah, Tharja, Lilina, Sanaki and (WE)Tharja are examples of Blade tome mages. Swordbreakers: Lucina loses to many kinds of units with Swordbreaker. It’s commonly seen on lower-tier swords such as Alfonse, Chrom, Stahl and Olivia. Armor: Armored units with Bold Fighter can circumvent Lucina’s Speed and KO her with strong physical damage. Fallen Hardin, Zelgius, the Black Knight, Effie, Gwendolyn and Halloween Jakob are hard counters to Lucina. With the combination of brazen attack/speed with the sealed falchion, lucina at neutral speed can reach a 65/48 attack and speed. Combined with desperation, lucina easily defeats almost any non lance unit. Even speed wave boosts this offence up to 65/54, guaranteeing that she can double almost anyone without sword breaker. Glimmer is the recommended move as it increases her already powerful player phase attacks, but it can be replaced by moonbow, draconic aura or Luna. The three charge specials should only be used if she is being attacked to get into brazen range, where’s the two charge ones should be used if reciporacal aid is being used to get her into that threshold. Even speed wave is chosen so that she can be hit on the first turn, then retaliate on the second turn, but this can be replaced with odd speed wave by preference. Reciporacal aid as mention above can be used to get her into brazen range, but it can also be used to heal her if she is taking too much damage during enemy phase. As alternate options, gale force could be used in place of glimmer. If Lucona gets hit once in enemy phase and is faster than the opponent, then she is guaranteed to get it on the retaliation, assuming she doesn’t OHKO the opponent. This build is lacking in damage due to replacing glimmer with gale force though, and is more resource heavy. Lastly, she pairs well with good tanks to protect her during enemy phase, and buffers to allow her to really shine on player phase. For teammates I would recommend bulky green units like Dorcas or male grima, bulky blue units like lukas, Effie or brave hector, and good buffers like Sothe, Brave Veronica, or Brave Lucina. My very first 5* unit, free summoned. Lucina carried me through pretty much the whole game, and without a doubt deserves my Summoner Support spot. A semi defensive / aggressive build for Lucina focusing on dishing out has much damage as possible, whether close-up or countering from afar while maintaining her HP. This build is expensive, and requires premium skills but is worth it in the end. The basic idea of this build is to place a teammate next to Lucina for the Bond Falchion effect to buff ATK for Heavy Blade and SPD to ensure a double. After the first combat (preferably during Enemy Phase), assuming Lucina doubles and procs HB, she will take out one enemy and has the ability to immediately devastate another with a fully charged Aether powered by Wrath during the Player Phase. Lucina will then heal up most, if not all her health and be ready for the next round of combat. In my opinion, Lucina is one of the most versatile heroes in the entire game, since she can serve as an offensive sweeper, dragon slayer, combat medic, and defensive tank given the right build. I personally cannot imagine having a team without Lucina or Masked Marth since dragons are running rampant in Arena as of now. She may have been overshadowed by Ayra, Soleil, and now Karla for the longest time, but her lower BST is patched up by the Bond Falchion refine (which is better than Sealed IMO), granting her basically a 20 might legendary weapon. Bond Falchion becomes even more relevant when Lucina is adjacent to a buff bot such as Brave Lucina, and can easily take advantage of those buffs on top of Bond Falchion&#039;s effects. Basically, she has the potential to stack a crazy amount of buffs given the right set-up. Finally, Even Speed Wave allows Lucina to catch up to the likes of speed demons such as Ayra and Karla even without Bond Falchion&#039;s effects. On even turns, she gets 44 Speed, which can be increased further to 48 with Bond Falchion. Now, all there is left to do is to get merges to take her even further. I do not have this build but as soon as I get a lucina this will become my main build for her I just love that she can attack anyone while lowering all of there stats at the same time. She will become my front line attacker that is an exelent debufer as well. Strong as a stand-alone warrior and gets significantly stronger when next to an ally on both player phase and enemy phase. Able to fight enemies of any color next to her s-class support Cherche. An all around viable unit in any situation. At full merge and summoner support she can reach god like status with her weapon effect in conjunction with tactics. Serves as a psuedo-healer. FalchionEffective against dragons. At the start of every third turn, unit recovers 10 HP. AetherResolve combat as if foe suffered Def/Res-50%. Unit recovers HP=half damage dealt. Defiant Spd 1Grants Spd+3 at start of turn if unit's HP ≤ 50%. Defiant Spd 2Grants Spd+5 at start of turn if unit's HP ≤ 50%. Defiant Spd 3Grants Spd+7 at start of turn if unit's HP ≤ 50%. Spur Atk 1Grants adjacent allies Atk+2 during combat. Spur Atk 2Grants adjacent allies Atk+3 during combat. Spur Atk 3Grants adjacent allies Atk+4 during combat.